Traveling by Car this Holiday? Read these Child Safety Tips. The National Highway Traffic Safety Administration (NHTSA) has announced its holiday campaigns for 2010. Since a survey by American Express Travel has shown that 74% of us will be driving to our Thanksgiving destination, many of us with our families, it's a good idea to pay attention. "Safety is NHTSA’s number one priority. Our mission is to reduce the number of deaths and injuries on our nation’s roadways by getting drivers, pedestrians and cyclists to change their behaviors once they get behind the wheel or on the streets," stated an NHTSA spokesperson. "High-visibility campaigns, supported by state and national advertising, help us achieve our mission." 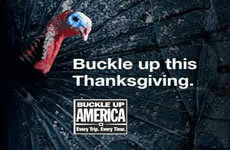 The billboard campaign for Thanksgiving holiday travel reads: "Too much turkey is no excuse for not buckling up." For Christmas the campaign slogan is "If you drive and drink, you'll get more than a piece of coal in your stocking." Another NHTSA holiday campaign is "Family Travel Safety." The NHTSA is joined by state highway patrol officers across the country in an attempt to prevent unnecessary traffic accidents due to alcohol. Also in relation to the "Family Travel Safety" campaign the NHTSA has identified 5 child safety issues that it wants you to be aware of, not just during the holidays, but all year round. A backover incident typically occurs when a car coming out of a driveway or parking space backs over a child because the driver did not see him/her. Many children are injured when a window closes on their finger, wrist, or hand, and some have even been strangled by power windows. Seat Belts. A child within reach of a seat belt may become entangled if he or she pulls the seat belt all the way out and wraps the belt around the head, neck, or waist, with the locking device preventing escape. Children are naturally curious and love to explore their surroundings. Hide and seek can turn deadly if they get trapped in the trunk. Children die each year from heatstroke in hot cars. Even though holiday time means winter, the southern 1/3 of the country will continue to have warm temperatures. So be aware that when left in a hot vehicle, a young child's body temperature may increase three to five times as fast an adult. High body temperatures can cause permanent injury or even death. Keeping safety in mind while driving to your timeshare Thanksgiving or Christmas vacation will help your entire family to have a fun and blessed holiday.